Andy Pafko, one of six sons of Czech immigrants, was born on Feb. 25, 1921, in Boyceville, Wis., and grew up on a 200 acre dairy, farm passed away of natural causes Wednesday (10-9-13) in a nursing home in Stevensville, MI at the age of 92. The 4 time All-Star (1947-50 started in ’48) played for 3 major league clubs during his 17 years in the big leagues. 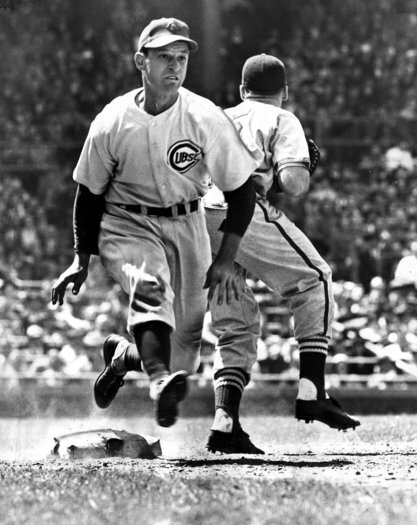 Andy started his career playing his first nine seasons (1943-50) with the Chicago Cubs. The Cubs purchased him from Green Bay Blue Sox for $1,000 in 1941. He was 4th in MVP voting the season that he led the Cubs to their last World Series appearance (1945). After his time in the “Windy City” he was sent packing to “da Bums” of Brooklyn where he played in yet another World Series, this time for the Dodgers in 1952. 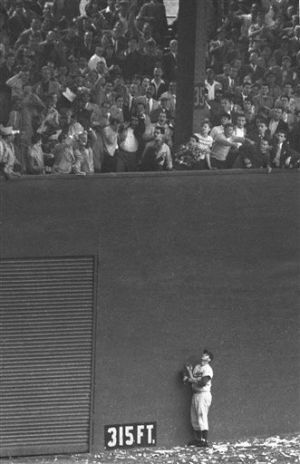 It was just one year after he watched Bobby Thompson’s “Shot Heard Around The World” beat the Dodgers in a one game play-off to get into the ’51 Fall Classic. The Boston Braves moved to Milwaukee in 1953 and for Roy Hartsfield and $50,000 the Braves acquired “Handy Andy” from the Dodgers and Pafko was back home (the Braves felt a hometown player would help generate fans). He spent time in the outfield, and played the role as the seasoned veteran who had post season experience. Pafko was able to use that experience as the Braves advanced to the World Series in 1957 and 58, winning it all in ’57 and boy from Boyceville was finally a World Champion! Pafko’s lifetime stats include 1852 games, 1796 hits, 213 home runs, 976 RBI, and a .285 Batting Average, not bad for a guy who didn’t start playing organized ball until after high school, since his school didn’t have a team. Pafko’s teammate Eddie Matthews has the distinct honor of being the cover picture of the first Sports Illustrated. Pafko has a first of his own. He was the very first Topps baseball card…1952 card #1. 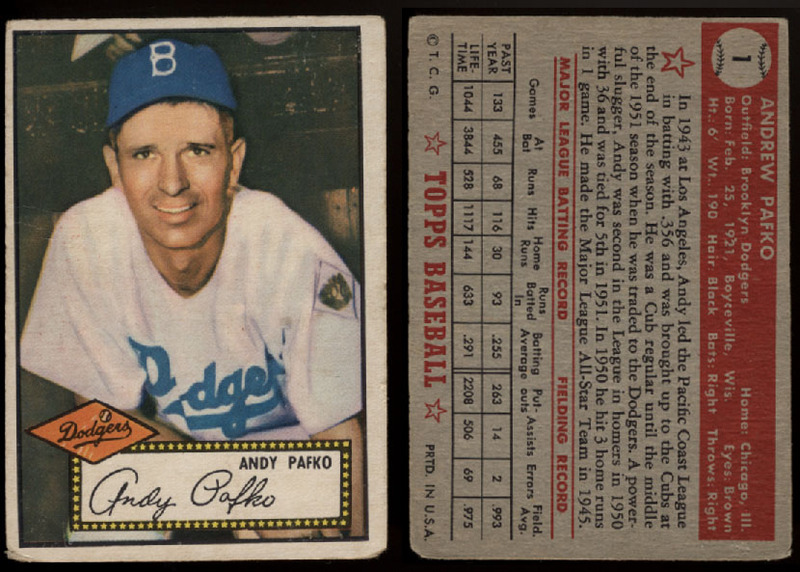 Even though Pafko never made the MLB Hall of Fame, or was a stand out super-star, his 1952 card is very valuable (Pafko is in both the Wisconsin Hall of Fame, and the Braves Wall of Honor at Miller Park). The reason for the high value on Pafko’s card is because back when baseball cards came out, they were often kept in numerical order strapped with a rubber band. Since Pafko’s was #1 in the series, his was on top of kids’ stacks, which resulted in them becoming extremely worn (as you can imagine). So if you come across a MINT 1952 Topps Pafko handle it with kid gloves because “Pruschka” (Pafko’s nickname) is work a pretty penny. This entry was posted in Baseball, Chicago Cubs, Milwaukee Braves, MLB, sports and tagged Andy Pafko, Brooklyn Dodgers, Chicago Cubs, Milwaukee Braves, MLB. Bookmark the permalink. Good story. I’m going to hunt for one of his 1952 Topps card on Ebay right now. Milwaukee Journal I looked through it today it brought back a lot of memories .